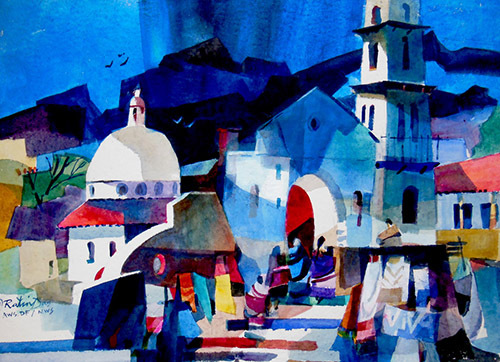 In this multiday workshop, Ratindra will focus on design in watercolor. He will share his deliberate, analytical, and intuitive approach to painting. His goal will be to stimulate student's creativity through the "thinking process". He will host demos and lectures in the mornings, emphasizing specific elements of painting. Ratindra will specifically address landscape painting, rather than portraits, etc. Topics covered will include: Exploring shapes and their relationships and placement on paper, using drawings and photographs in a creative way, extracting essential shapes from reference materials, and placing these in an orderly manner on paper. As well, Ratindra will touch on concepts such as lights and darks (values), the difference between "Nature's Light" and "Artist's Light", conceptual and ambiguous lights, value relationship with colors, color in design, how a color dominance (warm or cool) can achieve unity in a painting, and tertiary colors and their effects in painting. ***Watercolor West and Brea Gallery Members are eligible for a $50 discount on this class. To register using your membership, you must call the Gallery at (714) 990-7731 to register over the phone.